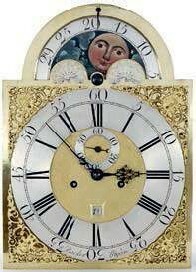 Signed Barker of Wigan, the brass dial has a matted centre and the moon phase is highlighted with stars, both of which are early features. The walnut cross-banded oak case has a long trunk door and ogee shaped top. Measuring 7ft 8in (2.34m) tall, it stands on original ogee feet. The Stonyhurst College Antiques & Fine Art Fair returns for its 24th year from February 22-24. Around 30 dealers are set to exhibit, offering a selection of antique furniture, silver, porcelain, rugs and jewellery at prices from £25-25,000. Catering is provided by the college and the gardens are open to visitors to the fair.